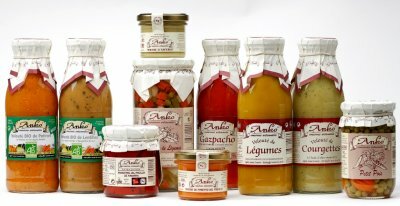 The family-run business Anko has never stopped adapting to the market trends since its creation in 1949, moving on from the vegetable culture to the processing of the most beautiful vegetables of the Navarrese land (Spain). Anko bottled vegetables, positioned on high quality niches, are preservative and additive free and exclusively elaborated with natural products selected in open fields according to methods respecting first and foremost the original flavour of a home-made recipe. Gazpacho, vegetables soups, organic soups… in 50cl bottles Extra Piquillo pepper, artichoke, pimiento mousses…in glass jars.